Forex Trade Cleaner is an expert advisor developed for the MetaTrader 4 trading terminal. It is developed specially for the ordinary Forex trader, but successfully used by many professional traders. Forex Trade Cleaner is an advanced forex system for closing open trades at specific day and time. The robot also supports Disabling Expert Advisors and Closing the MT4 terminal. There are also additional settings which the users may change and adapt the robot to their needs. It is designed to help forex traders which trade manually or use other forex robots which don’t support closing the trades at specific date and time. Forex Trade Cleaner is a software that was developed and tested from the best specialists and developers in this area with extensive experience in programming and forex trading. 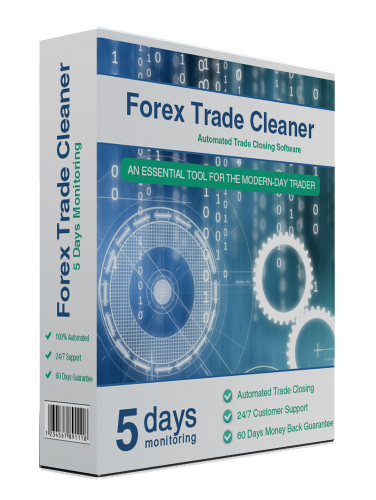 Forex Trade Cleaner can be used with any currency pair /including gold, silver and other instruments/ available in the MT4 terminal. There are not any restrictions. Forex Trade Cleaner can watch the trades of other forex robots and close them at specific time. It can watch up to 3 forex robots. When Forex Trade Cleaner is attached on more than one chart it may watch even more than 3 forex robots. For more information read the Forex Trade Cleaner Settings page. Forex Trade Cleaner information box show all the information you need: the day and time when the trades to be closed, whether the MT4 terminal will be closed or whether the Expert Advisors will be disabled and so on. This is very convenience and you can find all you need easily. Check below image to see what Forex Trade Cleaner shows in the information box. Forex Trade Cleaner can be configured to close opened trades at specific day and time. The robot supports closing trades on Monday, Tuesday, Wednesday, Thursday and Friday. The time can be set precisely too in format HH:MM (hours minutes). Most of the forex robots available in the market don't support this function. But leaving trades during weekends or during holidays could be dangerous for the accounts. To avoid weekend gaps or big movements during holidays it is recommended to use Forex Trade Cleaner to close all the on Friday evening or when you want. Forex Trade Cleaner can be configured to close only trades which are in profit. The profit value can be set in the robot settings. This option let you manage your trades as you want. Some times closing trades is not enough because the forex robots (expert advisors) can continue trading. Therefore we have developed Forex Trade Cleaner to allow you disabledin expert advisors too. Of course this feature can be turn off and on at any time you want. Once disabled the expert advisors can be enabled only manually by the forex trader. It is very safe to combine closing trades and disabling expert advisors. Some times closing trades or disabling expert advisors is not enough. You may need to close the MT4 terminal too. Therefore we have developed Forex Trade Cleaner to allow you closing the MT4 too. Of course this feature can be turn off and on at any time you want as other features in Forex Trade Cleaner. Once closed the MetaTrader 4 terminal can be run only manually by the forex trader. It is very safe to combine closing trades and closing MT4 terminal. Forex Trade Cleaner has the below listed features and many other useful options. Compatible with all other Expert Advisors on the Forex Market. Closing trades at specific day and time. It can disabled Expert Advisors at specific day and time. It can close MetaTrader4 at specific day and time. You will be able to use the robot on 1 real and 2 demo accounts with this license. There is a free option for trying the robot on 1 demo account.